Hey all. Last week I finished a book for The Sketchbook Project! 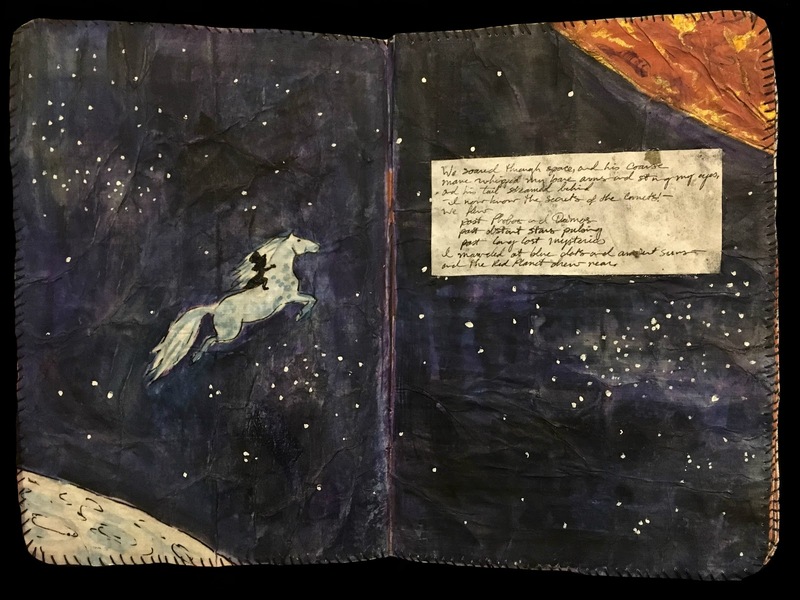 The Sketchbook Project is a collection of mini sketchbooks housed in the Brooklyn Art Library. 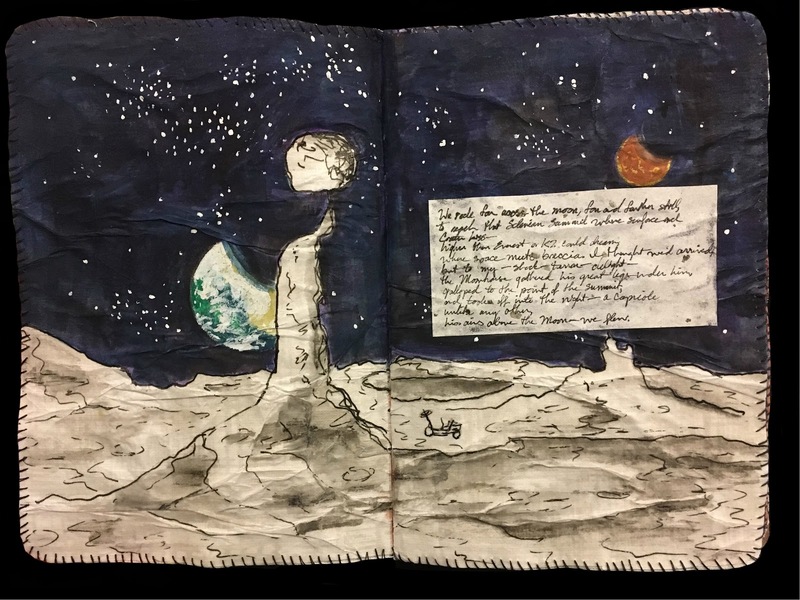 Artists from all over the world can order a sketchbook, fill it with art, and mail it back to join the permanent collection. I was just notified that my sketchbook has been delivered safe and sound in Brooklyn! Thank you, USPS, for taking care of my baby. Pretty soon it will go on a short tour around the country with the other 2019 sketchbooks before returning to its new home on the shelves of the art library. In my previous post, I walked you all through some of the decisions and artistic process for my sketchbook. What started as a plan for 16 pages of black and white ink drawings turned into a book of 8 full-color watercolor and ink illustrations. 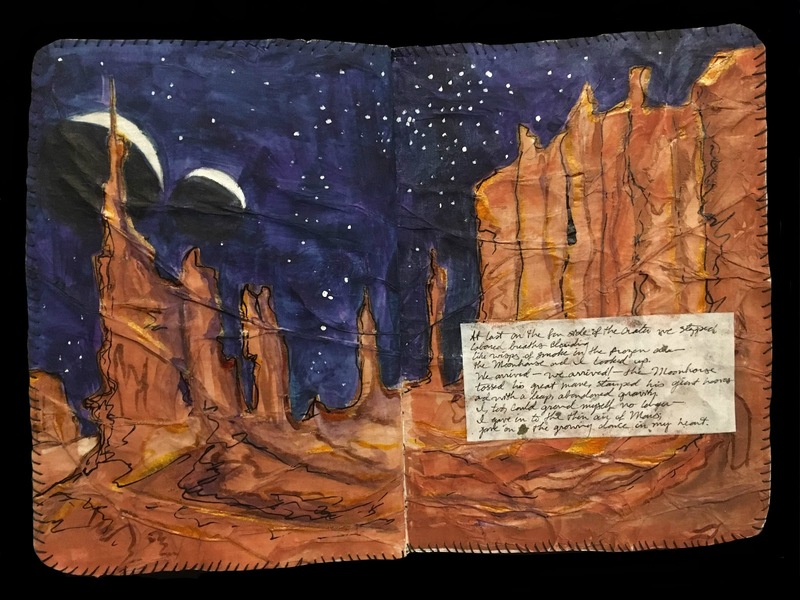 Each page also has includes a stanza of a poem telling the story. Today I'll finally show you the finished product! 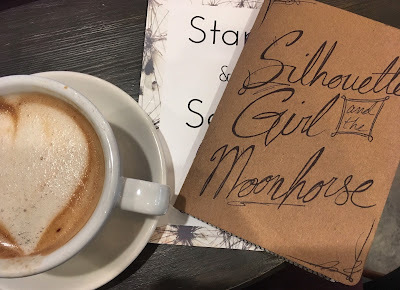 The large-text portions below are each stanza of the full-text poem found in Silhouette Girl and the Moonhorse, so you don't have to strain to read my tiny handwriting on each page. The regular text is my notes and commentary, not included in the actual book. Enjoy! I left the earth’s atmosphere. One of my favorite parts of the brainstorming process was crowd-sourcing ideas for the girl's transportation. I hopped on Twitter and Facebook to ask for ideas, and the responses were amazing. It's been a while since I crowd-sourced like that, but I love doing it. People can be so creative! Several friends said the girl should travel by unicorn, one said a space segway, another said a dragon covered in feathers. My brothers suggested an iPod, traveling by the magic of music, or an imperial star destroyer from Star Wars. One friend suggested a book, because that's how she travels the universe. With so many great ideas, I actually picked two modes of transportation. The second one in particular quickly became an integral part of the story. 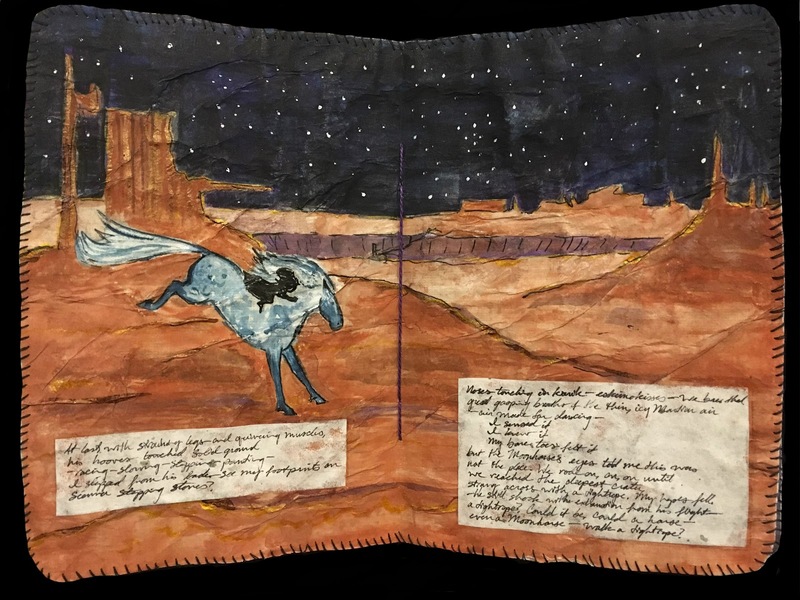 The girl would fly to the moon on a "steampunk" space shuttle, but on the moon she would meet a magical moon-horse with whom she'd travel across the moon and all the way to Mars. As a kid and teenager, I was obsessed with horses. That's right, I was a "horse girl." I still love them, though I haven't ridden since high school. 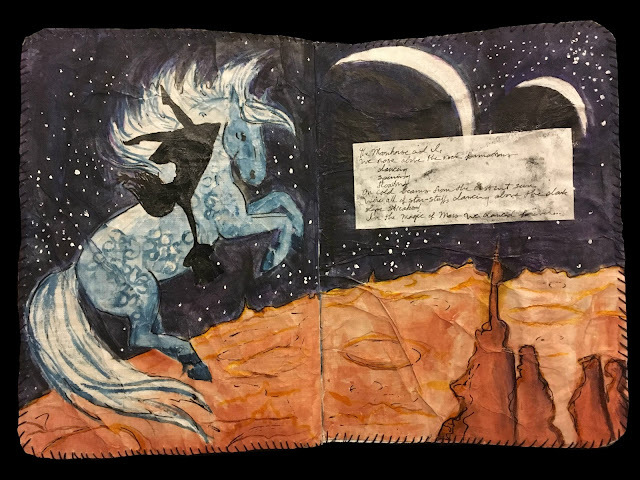 I felt that having the girl travel by horseback through space would make this sketchbook more personal, a nod back to my own childhood and my longing to travel the world on horseback. In recent years my fascination with space-travel has grown a lot, so combining the two felt very natural to me. leader of the Lunar herds. with a flick of his flowing tail. From here, the girl and the horse travel beyond that unique balancing rock formation in the distance to take off at the highest point on the moon—the Selenian summit. his airs above the moon—we flew. This is where it began to change a lot between the original intent and the finished product. 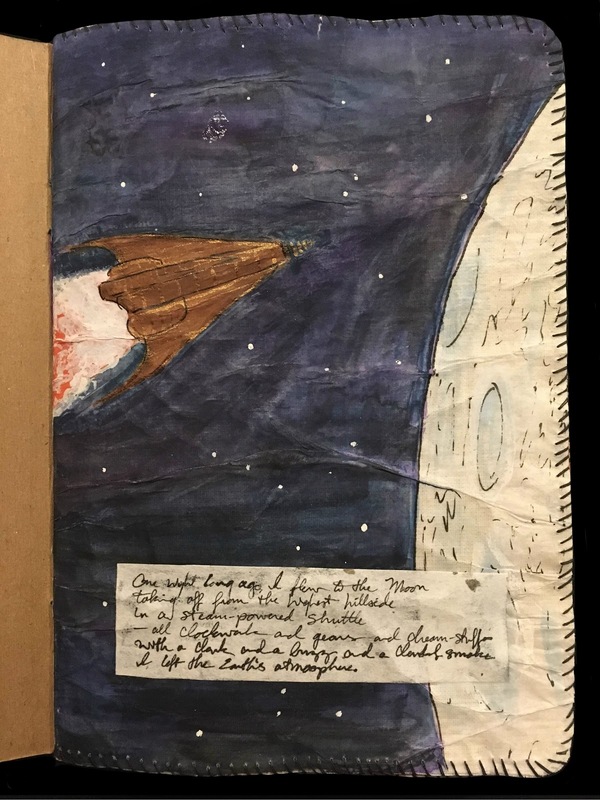 In my original 16-page sketches, I had a close-up illustration of the distant lunar rover, and an image of the girl and the moon horse taking off at the selenian summit. I had to cut these and some other illustrations to lower the page count and compensate for the thick, stiff paper cloth. I miss some of these illustrations, and I may still draw them one day, but the scenes I did include are much more intentional. Like a carefully edited book, the remaining content is made stronger by cutting out all unnecessary information. and the red planet drew near. 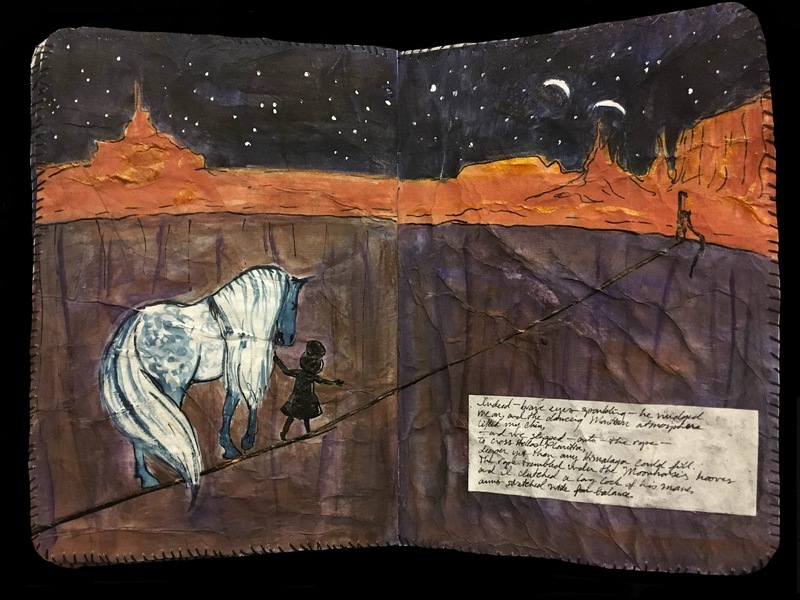 Flight to Mars was heavily inspired by the famous Lipizzaner horses of Austria and their gravity-defying classical dressage. I've always wanted to see Lipizzaners in action, but have had to content myself with pictures and videos of those remarkable airs above the ground. 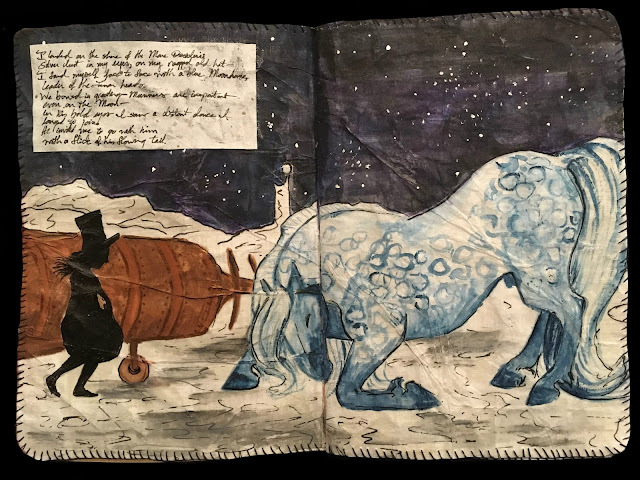 For this scene, I researched and sketched the capriole move for our moon-horse's long flight. even a Moonhorse—walk a tightrope? 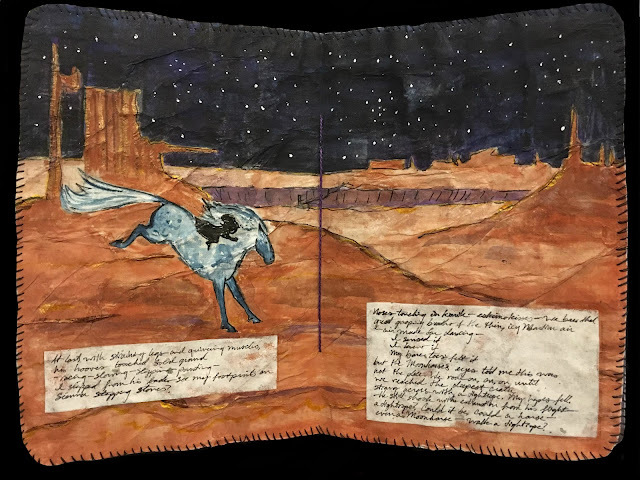 Originally, Silhouette Girl and Moon-horse's landing on Mars would only be implied—the first Mars scene was to be a close-up of the girl and the horse examining the red Martian dust. From there, they'd travel toward a Mars rover before arriving at Hellas Planitia, the deepest crater on Mars. For the new version, however, I cut out the Mars rover entirely, and replaced the close-up with a wide-angle landing scene. I felt this would better tie the narrative together. I took the background from a scene in which our two characters are riding across the Martian plains, and replaced their simple ride with the more dynamic landing action that you see above. deeper yet than any Himalaya could fill. arms stretched wide for balance. Like I said, I cut out a lot of planetary travel, but I couldn't bring myself to cut out the scene above! For a long time I've had a mental image of crossing the deepest Martian crater, Hellas Planitia, by tight-rope. In reality the downward slope of the crater is much too subtle for a tight-rope, but the entire book is lodged firmly in the surreal—there's nothing realistic about it! Being fanciful to begin with, I indulged myself and stretched a rope across the crater. the Moonhorse and I looked up. and with a leap, abandoned gravity. gave in to the growing dance in my heart. This scene was inspired by Bryce Canyon in Utah, where orange towers and columns ("hoodoos") rise from the ground, creating natural arches and spires like a princess's castle. This was one of the first sketches I made, and it changed the least over the whole process. I read somewhere that since gravity is lower on Mars, there are rock formations there that would be impossible on Earth. I don't know if that's actually the case (it makes sense to me), but I definitely had that concept in mind when brainstorming Martian geography. While this particular scene is very reminiscent of Bryce Canyon, I still tried to imbue it with that mystical, low-gravity feeling! However, this final scene is where weightlessness truly comes into play. The gravity on Mars is about 1/3 of what it is on earth, so in reality our beloved travelers would still be bound to the ground. Even the moon's gravity, 1/6 of our own, doesn't allow floating like this! But this is anything but realistic. They traveled all this way to dance, how could they not dance in mid-air? on cold beams from the distant sun. This last page came about weeks after the rest of the images were complete. I kept this final page blank, unsure if I'd write the full-text poem on it, leave it blank, or add one last illustration. As you can see, I chose the latter! I only knew what I wanted to do with it when I started writing the poem and that last line, "or so I dreamed," came to mind. I hadn't intended for this adventure to be a dream, exactly, though it has all the characteristics of a dream. But when I had that line, that's what the story officially became. I envisioned the girl waking on a hillside, as if she fell asleep stargazing and woke with the sun. This project was both challenge and game for me. I indulged a lot of fancies in this book, and the result is everything I never knew I wanted. Magic and fantasy set in space... a simple but highly unlikely journey, to say the least! For most of the creation process, I held off on painting the girl - I seriously considered whether she would be Silhouette Girl or someone else, someone with features and visible details. But I think in my gut I knew this would be Silhouette Girl. Who else could manage an adventure like this? It was truly made for the girl who holds the tail of a tornado, conducts wildebeests like an orchestra, and releases a cloud of butterflies from her hands! I kept telling myself it could be anyone doing this - any little girl could dream this up. Why lock it down for only Silhouette Girl? powered me through writing my previous blog post. That's where my thinking has been skewed. For a long time, I've thought of Silhouette Girl as an individual. Where is she going next, what fanciful thing is she doing this time? However, she's not an individual. She's a concept. Any little girl can be "silhouette girl," because it isn't about the things she actually does. It's about the metaphors. 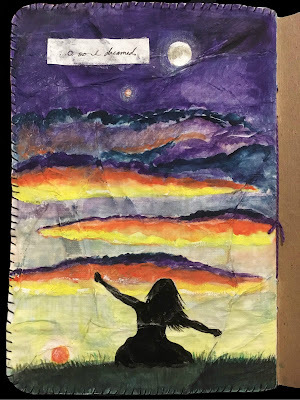 The Silhouette Girl series started as a reaction to tragedy - innocence and weakness against one of the greatest forces on earth, a little girl holding the tail of a tornado. The series has grown and taken on new metaphors with each drawing and painting, but the core must remain the same - innocence overcoming the impossible. Weakness overpowering the greatest powers. Childhood and imagination conquering reality. If Silhouette Girl remains as she should be, a concept instead of an individual, then she really can be anyone. Anyone who values innocence and imagination can be Silhouette Girl. With that realization, I inked in the silhouettes, covering all the loosely-sketched details like facial expressions and folds in her clothing. Our favorite girl has a ragged top hat and her new friend from the moon... she has everything she needs. With this blog post, I put a close to this brief project. I had a lot of fun with it, and I was a little sad to tape the mailer shut and send my baby off to New York... but I look forward to seeing it again someday! If you find yourself in NYC, be sure to stop at the Brooklyn Art Library and see my sketchbook for yourself. Silhouette Girl would love to have visitors!